It's important to make sure that everyone in your home, school, or place of business knows the basics of fire safety. Posters can serve as a great training tool to teach kids and adults alike what they need to know, as well as provide visual reinforcement for what they have already learned. 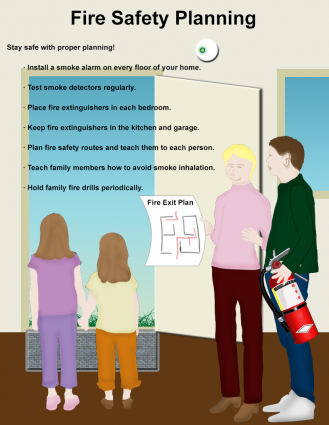 Download the printable fire safety planning and home fire safety posters provided here and use them in highly visible locations. 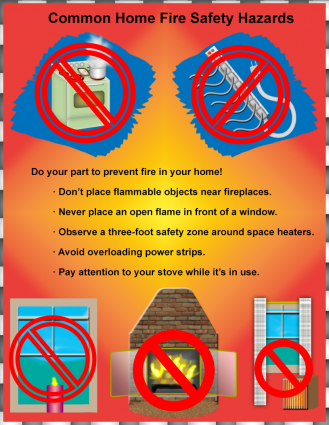 It's easy to download, save and print LoveToKnow's fire safety posters. The printable posters provided here are designed to print on a standard 8 1/2" X 11" page. Choose the "Fire Safety Planning" graphic if you want a reminder of what's involved in prevention and preparation and opt for the "Common Home Fire Safety Hazards" design if you'd like a graphic representation of some of the most common household mistakes that often lead to avoidable fires. U.S. Fire Administration (USFA): Visit the website of the USFA, a division of the Federal Emergency Management Agency (FEMA), to order free fire safety posters on a variety of topics. There are options for all age groups, including posters specific to home and workplace safety. Some posters are available in Spanish as well as English. Place your order online and the posters you select will be shipped to you at no cost. Scholastic.com: The Scholastic website has a selection of free printable posters designed for kindergarten through second grade kids. There are several poster options, with selections appropriate for both home use and to supplement fire safety school kits. Additional no-cost learning materials are also available via the site. National Fire Protection Association (NFPA): The NFPA website features a series of downloadable posters designed to convey important fire prevention messages to senior citizens. Each printable poster is provided in both English and Spanish versions. Fire safety is such an important topic for everyone to be informed about. Displaying posters in your home and workplace can be a great way to make sure that valuable information is visible and accessible at all times. Use them as teaching tools when explaining important safety concepts and procedures, and keep them on display to provide reinforcement and ongoing reminders.